Jonas Quinn arrives from Kelowna bringing urgent news. His research has determined that naquadria, thought to be native to his planet, is in fact the result of a chain reaction that is converting naquadah deep underground, and the instability of the expanding mineral threatens to obliterate Kelowna and render the entire planet uninhabitable. Delegates from the three major powers of the planet, now known as Langara, arrive at the SGC to discuss the future of their world. However, the historic animosity among the three nations frustrates even Daniel's diplomatic skills, and the negotiations deteriorate almost immediately. 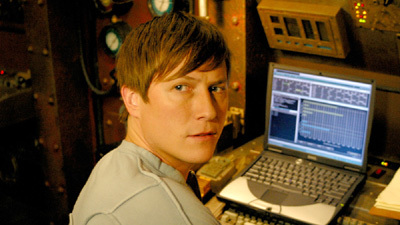 Carter returns to Kelowna and joins Jonas and his research assistant, Kianna, in finding a means to avert the crisis. Carter suggests setting off an explosion along a fault line to block the chain reaction, and the Kelownans have just the device to deliver the bomb: a Deep Underground Excavation Vehicle. Carter notices that Jonas is clearly attracted to Kianna, but she is suspicious of Kianna's knowledge of Goa'uld technology, and when confronted, Kianna reveals herself to be a Goa'uld. However, her expertise is vital, and Kianna joins Jonas, Carter, and Teal'c in piloting the DUEV through layers of rock and magma toward the naquadah vein. The DUEV stops one kilometer short of its target, unable to proceed. Kianna volunteers to use Tok'ra crystals to create a tunnel large enough for one person to pass through and position the bomb. After arming the bomb, however, she is too weak to make the climb back, but the team refuses to leave her behind. Just as the DUEV reaches the critical point, an exhausted Kianna returns through the portal. The vehicle is piloted toward the surface as the bomb is successfully detonated and the planet is saved. Kianna is dying, but the Goa'uld sacrifices its life to allow the host to live, and Kianna returns with Jonas to her life on Kelowna. Naquadria is not native to P2S-4C3 and does not occur in nature. Thanos was the Goa’uld who occupied P2S-4C3 (Langara) 3000 years ago. He developed a process to convert raw naquadah into naquadria. Historical documents indicate Thanos was destroyed in a cataclysmic event which released subatomic particles and triggered a chain reaction that converted the first vein of naquadah. In another 10,000 years the converted naquadria would have decayed back into naquadah, but the Kelownans mined it and set off the naquadria bomb which triggered the conversion of the second, deeper vein which threatens to destroy the planet two years later. The heat and pressure formed by the conversion of the larger, deeper vein of naquadria would result in an explosion that would destroy half of Kelowna’s land mass and render the entire planet uninhabitable. The Deep Underground Excavation Vehicle, originally designed to mine naquadria, will drill through 20 kilometers of solid rock to deposit a small nuclear device that will trigger a shift along a fault line and isolate the advancing naquadria to break the chain reaction of conversion. Langara is the new name of P2S-4C3, taken from an ancient dialect common to all three nations and chosen by committee as a symbol of the planet’s new unity. Madronus is approximately 14,000 light years away, and may or may not be the same as Madrona. (see “Touchstone”) The Madronans are a peaceful and advanced society with sufficient resources, but will not be subjected to the likes of the Langarans.